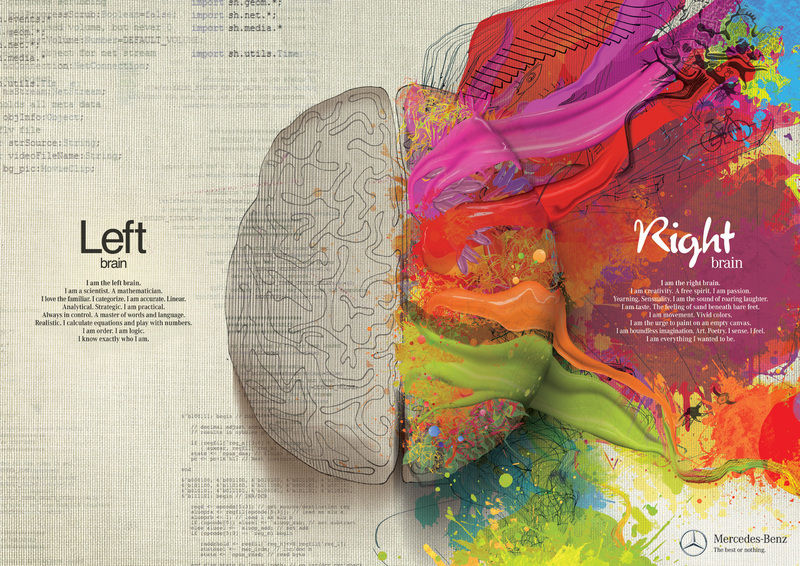 The Left and Right Brain – in Conversation!! Right brain (R) : Hey! Left brain (L) : What ? R : Whatchu doin ? L : Doin some analytical thinkin.. I am stuck on this thing since last night without any solution. Its driving me crazy! R : See now that’s the problem with you. Your ways are too… you know… ROBOTIC! L: Really? So what according to you, shall solve my problem? Rainbow crayons and Unicorn stickers? R: You can try. Wudn’t hurt you know. L: You’ve got to be kiddin me. R: I don’t mean to offend you but logical reasoning and experimentation are not the only things that are the essence of existence. There are other important things too. R: Look you are doing it again .. Can you just, for once, think with your heart and not your brain? L: You mean my full-sized aortic pump? L: Sorry but everything that’s been said or done has got to have some proof to it. Otherwise how can one believe in it? R: Nobody has proved the existence of God. But people believe in Him, don’t they? R: That is because you never see beyond experiments. There is a colourful world out there waiting to be explored and it needs an open mind. A mind that is free of rusty scientific locks and dusty analytical bolts! L: Tell this to your doctor the next time you are down with diarrhoea. They will treat your runny system with an open mind without applying any medical-science locks and bolts whatsoever. R: Dont you see that you are limiting your world ? Dont you see, that by defining one shortest pathway as your mode of travel you are missing out on the longest but the most beautiful one? R: ok,lets take an example of the problem on which you were stuck earlier. What was it about? L: I was trying to prove this theory. I cannot get through a certain area in the flowchart which is quite convoluted, even for me. R: ok, i don’t know one bit about your theory or what the hell a flowchart is,but i surely know the solution to your problem. R: TAKE A BREAK. RELAX. LISTEN TO SOME MUSIC. You were up the whole night. Clearly, you are not in the right state of mind to work. No wonder you are stuck. Indulge in some creative hobby for sometime. It will rejuvenate you. Once you take a fresh start with a fresh perspective at your problem, it will definitely resolve the issue you are facing. Creativity pays off in the weirdest of times. L: Utter waste of time. I shall utilise that time continuing at my work instead. R: Or you could try what i suggested and know that the Right brain is always right! 😉 If there was no creativity, everything would have been boring GREY. Just the way you are. L: Really? If there was no science you wouldn’t have known that the earth was round. R: Yeah, but if there was no art, you wouldn’t have known that the earth was so pretty. L : If there was no Math, you wouldn’t know that 1+1 is equal to 2. L: If there was no Darwin, you wouldn’t have known that we had all evolved over millions and millions of years into the human beings we are. R: If there was no Da Vinci, you wouldn’t have known what we are going to be evolved into, after millions and millions of years from now. L: i am responsible for Logic. R: i am responsible for Love. L: i am responsible for discovery. R: i am responsible for curiosity. And you very well know curiosity if the first step towards discovery. L: i made the “Eureka” moment happen. R: i made the joyful endeavour that led to the “Eureka” moment. L: So thats it.. i guess we have reached a deadlock. There is no end to this argument and there clearly are multiple outcomes to this probability. R: You just said “WE BOTH WIN”, in Robotian. L: Will relax and listen to some music now. Hope that helps me get to a solution about my problem. R: I know that it will. ← Dont Need an AD agency….? Think Again!! I can help you Guys with your own copyright images. Yes, I am a photographer! Let me know if you need my services. Ok.. we will surely tell you if we need one!